(1858-1923) Born in Franklin, Tennessee of German parents in 1858, Matilda Lotz showed artistic promise at a very early age and by seven was drawing the household pets and farm animals. During the Civil War the family home was commandeered by Confederate forces for a hospital. Following the war, economic conditions forced the Lotz family to head West. In 1874 she began a six-year course of study under Virgil Williams at the School of Design in San Francisco. She won several medals and graduated with highest honors. Matilda was also a pupil of William Keith, and in the 1880s furthered her art study in Paris under Emile Van Marcke, the animal painter. While in Paris she was awarded two gold medals by the Paris Academy of Painting (the first woman ever to be honored by the Academy). Returning to San Francisco in the mid-1880s, she painted portraits of such notables as William Hearst and Leland Stanford. 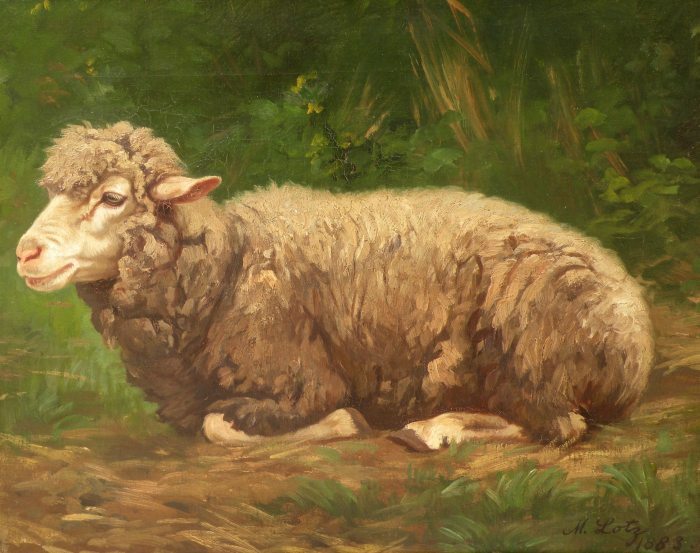 In the 1890s she returned to Paris where she was closely associated with Rosa Bonheur for several years.. In the late 1890s she was invited for an extended stay at an estate in Tata, Hungary where she continued animal portraiture. At the outbreak of WWI she was living in Algiers until she was expelled by the French. Abandoning her belongings and paintings, in 1915 she returned to Tata where she remained until her death in 1923. Exhibitions: San Francisco Art Association; Mechanics' Institute; Paris Salon.